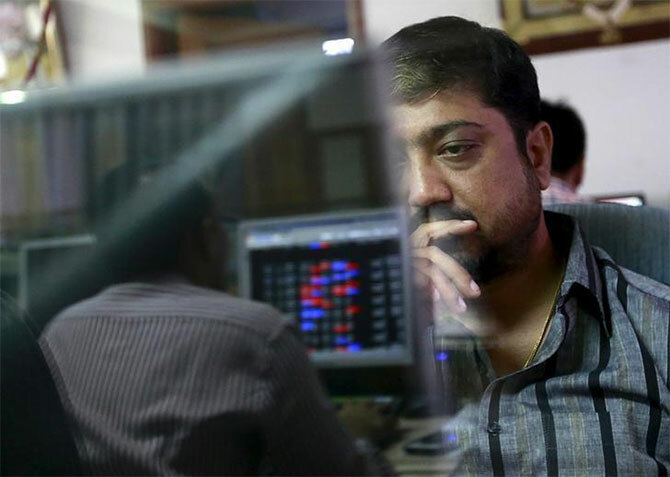 Equity benchmarks Sensex and Nifty on Monday faced high volatility and closed with losses as investors turned cautious ahead of the start of corporate earnings season and polling for the general elections. Among the Sensex constituents, Yes Bank emerged as the biggest laggard with 2.66 per cent drop in share price. Other top losers were Bajaj Finance, Vedanta, Tata Motors, Reliance Industries and SBI -- dropping as much as 2.57 per cent. On the other hand, Infosys, Mahindra and Mahindra, ONGC, TCS, PowerGrid and NTPC closed with significant gains on the Sensex chart. Of the 30 Sensex shares, 20 witnessed losses and 10 saw gains. The 30-share gauge opened higher at 38,993.60 against the previous close of 38,862.23. Intra-day, it hit a high of 39,041.25 and a low of 38,520.96, swinging over 520 points. The BSE benchmark finally settled at 38,700.53, losing 161.70 points or 0.42 per cent. Similarly, the 50-share NSE Nifty started off on a positive note at 11,704.35 against the Friday's close of 11,665.95. The index traded in the range of 11,549.10 and 11,710.30 during the day. It swung over 161 points during the session. The NSE barometer finally closed at 11,604.50, up 61.45 points or 0.53 per cent. The market breadth was tilted in favour of sellers as 1,534 shares fell and 987 advanced on the BSE. In line with Sensex, the broader indices also saw hefty losses. Large cap index tumbled 0.79 per cent, midcap 0.87 per cent and smallcap 0.57 per cent. Sectorally, among the worst performers were realty, losing 2.67 per cent, followed by energy 1.67 per cent, oil and gas 1.47 per cent and finance 0.8 per cent. Bucking the overall trend, BSE IT rose 0.8 per cent and Teck gained 0.6 per cent. Of the 19 sectoral indices, 15 ended in the red and 4 closed in the green. In broader market, smallcap and midcap indices have outperformed the benchmark Sensex. BSE smallcap gained 1 per cent, midcap climbed 1.5 per cent and largecap advanced 1 per cent. "Domestic markets started this week on a weak note given global cues on account of drag in US-China trade deal and Brexit delays. Investors have turned cautious given rise in oil prices and sharp rally in the last couple of months leading to premium valuation of key indices. Additionally, general elections and start of Q4 earnings season is adding to the cautiousness, we may see some profit booking in the near-term given sharp run-up in markets," Vinod Nair, Head of Research, Geojit Financial Services, said. The country's top two software exporters TCS and Infosys will announce their quarterly earnings on Friday. Lok Sabha elections will begin on April 11 and will be held over seven phases followed by counting of votes on May 23. Asian markets closed mixed on Monday, helped by better-than-expected US jobs data and signs of progress in US-China trade talks. South Korea's KOSPI gained nearly 1 per cent and Hong Kong's Hang Seng index rose 0.41 per cent. While Japan's Nikkei slipped 0.21 per cent and China's Shanghai Composite index edged lower by 0.05 per cent. In Europe, major market indices were trading mostly lower on Monday. Meanwhile, the Indian rupee has started feeling the heat of rising crude prices and was trading 38 paise lower at 69.61 (intra-day) to the US dollar. Besides, the strengthening US dollar on account of a rebound in payrolls data further impacted rupee sentiment.